Electronic ebook edition. A successful transition from ICD-9-CM to the ICD-10-CM coding system will require focused training for individuals and organizations. New resource will help create a solid foundation for all levels of ICD-10-PCS coding with examples and case studies to explain key coding concepts. An educational guide to the structure, conventions, and guidelines ICD-10-PCS coding. 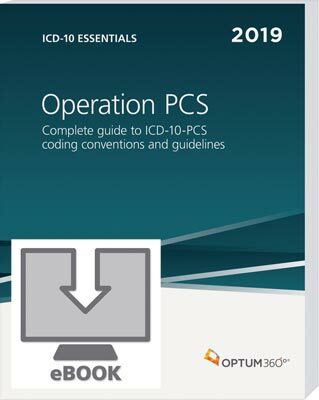 ICD-10 Essentials: Operation PCS is a companion resource for ICD-10-PCS that provides in-depth explanations of everything from the basic format and structure of the ICD-10-PCS code set to use of the supplemental appendixes to code assignment based on appropriate application of the coding guidelines. Using coding examples and case studies, correct code assignment is explained with an emphasis on application of the coding and reporting guidelines. The new edition now contains operative reports with coding and rationale along with coding examples and case studies designed to clearly illustrate coding concepts and reinforce understanding from the most basic coding questions to the most complex. New — Optum360 Edge —Operative reports. The current edition combines content from Coding from the Operative Report and Operation PCS into a single comprehensive resource. Optum360 Edge — Hundreds of coding examples/case studies. Operation PCS provides multiple case studies illustrating application of each ICD-10-PCS guideline. Optum360 Edge — Illustrations. Both anatomical and procedural illustrations are provided to further enhance understanding. Optum360 Edge – Comprehensive index. Quickly identify all relevant coding examples and case studies contained in Operation PCS when researching correct coding of specific procedures and correct application of coding guidelines.